Few environmental projects focus community attention as dramatically as those that seek to create (or retrieve) parks and trails along urban waterways. 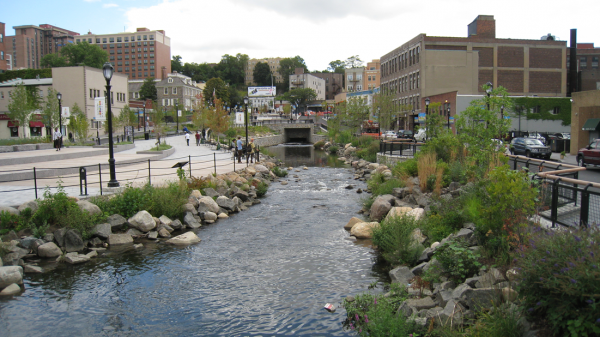 The Groundwork network has achieved significant success on such projects, including the Saw Mill River Daylighting Park in Yonkers, NY; the Spicket River Greenway in Lawrence, MA; the Elizabeth River Greenway in Elizabeth, NJ; and the Mill Creek Greenway in Cincinnati. Park projects along urban waters can be modest to large and complex. They may include docks, fishing piers, canoe trails, playgrounds, greenways, and riverfront improvements—all providing public access to the river. River parks become venues for events, education, recreation, and contemplation. They can also be catalysts for neighborhood revitalization and, in some instances, drivers of major economic re-development in distressed cities. The Saw Mill River’s water power made Yonkers a booming industrial town starting with grist mills in the 1650s. Over time, because land was in short supply, the river was squeezed and covered over in places. Finally, in the 1920s, the last bit of river in downtown was covered by a parking lot (renamed Larkin Plaza). In the 1960s, industry started to move elsewhere, and by 2000, empty and boarded up buildings surrounded the parking lot and downtown. Many circumstances converged to make”daylighting,” or uncovering the previously buried sections, of the Saw Mill River a reality. The US Army Corps identified “daylighting the covered reach in Larkin Plaza” as a valid restoration project (1992). EPA and the National Park Service launched Groundwork Yonkers, with City buy-in, to focus on environmental projects (1999). “Daylighting” was a priority project, and Groundwork enlisted Columbia University design students to create a vision (2002). Scenic Hudson provided funding for Groundwork to hold community input sessions (2004). And, the City began courting redevelopment to revive the economy. Having a non-profit partner deeply involved in community engagement and environmental details was a boon for the city of Yonkers. Local foundation funding (Westchester Community, Hudson River) funded staff to begin a larger planning effort. Critical multi-year funding from the EPA Office of Water and the NY-NJ Harbor Estuary Program sustained the community process, a habitat plan, and on-the-ground work with the City’s Downtown and Waterfront Development Office and the engineering design and construction team. While Groundwork began the partnering work, the effort grew to involve local businesses, numerous community partners, and state and federal funding agencies. These have evolved into long-lasting working relationships. One of the coolest things about this project is that a new path was created for the river. The underground river channel was left in place for “overflow” in heavy rainstorms—which otherwise would have flooded the park. A chamber was built around the underground river channel to divert part of the river flow into the new river path. Because the presence of historical contaminants meant the site was the a brownfield, the new path was lined with heavy vinyl. 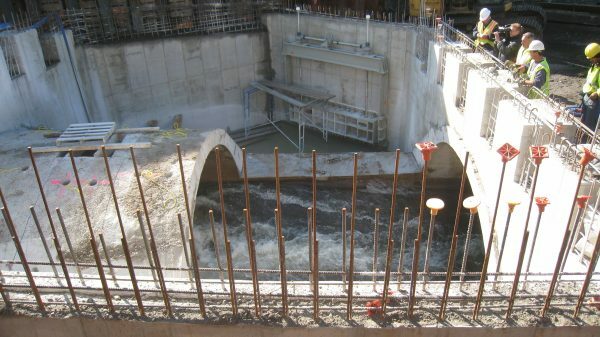 In April 2012, within six months of water flow, the river was teaming with life! Ecological Impact: 14,000 square feet of new aquatic habitat, including a tidal pool and two freshwater pools, support many species (turtle, ducks, blue crab, black-nosed dace, the endangered American eel, and more). Native plant species planted as riparian habitat attract beneficial insects to encourage food chains. Cultural Impact: The park attracts human beings with the sound of water and its beauty. The park hosts tours, art shows, events, music, public art, and a seasonal farmer’s market run by Groundwork Hudson Valley. 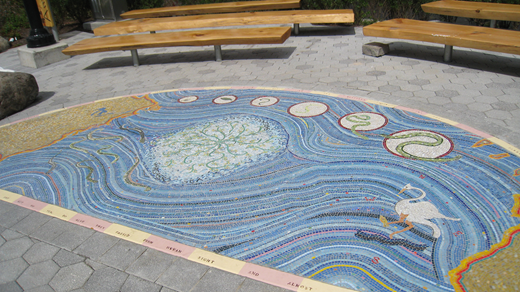 The American Eel Outdoor Classroom, complete with a mosaic showing the eel’s journey from the Sargasso Sea to the river, is used by local educators. Economic Impact: The City has already credited the new park with triggering redevelopment, including a $7 million renovation of a tech firm with 180 jobs, a $43 million historic redo of five to seven buildings, and an apartment tower and mixed-used complex to replace abandoned buildings along one side of the park. Establish a big vision early, and make sure the vision is shared, not created in isolation by your organization or by “absent” planners. Plans that do not involve the whole community often lead to flawed designs and contentious public meetings. Keep the vision alive through events (often over many years) that connect with diverse audiences. Publicize the health, economic, ecological, educational, and employment value of the project. Encourage partnerships, as you will need community, political, economic, and business support. Bring resources—funding, time, experts—to the table. Have your legislators be cheerleaders—they love being involved in bold projects. Involve youth, as they can sell the project better than you. Provide reliable technical information on costs, design, cleanup, and habitat issues. Secure a seat at the table to plan and design the park once funding is in place. Ensure that the design actually enhances aquatic habitat and water quality. Ensure that you have organized programs for the park to begin as soon as it is completed. Anticipate and deal with crime, vandalism, and unwanted after-hour activities. With the first stage of the daylighting project completed, the City has moved ahead with Daylighting Phase II-Mill Street and Daylighting Phase III—Chicken Island. While these are very modest (50 feet, 100 feet, 400+ feet), they bring attention to the history of covering rivers, amazement that nature can respond quickly to daylight, interest in where the river still runs underground, and enjoyment of the rushing sound of water in a “dry” environment. Groundwork has used the work on the park and river as a catalyst with its area youth and residents to engage them in stewardship. 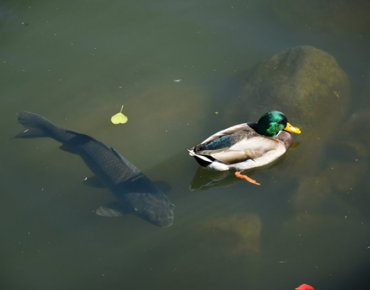 In August 2014, the US Fish & Wildlife Service designated its collaboration with Groundwork Hudson Valley, to foster urban river stewards, as an Urban Wildlife Refuge Partnership. Groundwork also received an Urban Waters Small Grant to build an “Eyes on the River” stewardship program. Lessons Learned: Reclaiming Urban Waters Across the U.S., May 2012, Groundwork USA.